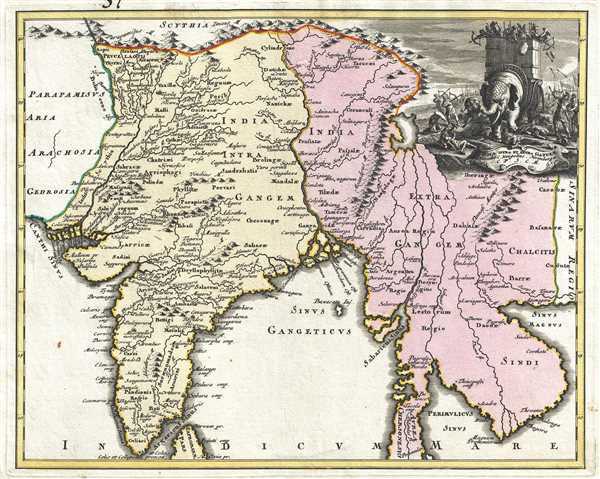 18th century map of India and Southeast Asia incorporating Ptolemaic geography with elaborate 'war elephant' cartouche. India Intra et Extra Gangem. An exceptional 1720 map of India and Southeast Asia from Christoph Weigel's Descriptio Orbis Antiqui, this map incorporates Ptolemaic geography with 18th century geography. All the place names on this map come from the Geographia of Claudius Ptolemy, which have then been integrated on to known places. India Intra et Extra Gangem simply means 'India on this side and that side of the Ganges.' The map begins on the western side of India and moves across the Ganges to modern day Bangladesh, Burma, Laos, Cambodia, Vietnam and Halong Bay (Sinus Magnus). The map also covers from the Himalayas to Sri Lanka (Taprobanae). At the top right corner sits an elaborate engraving of a war scene, where a fearsome elephant, in armor, is carrying a large box on its back containing several soldiers who are, in turn, attacking enemy forces on the ground from the elephant's back. There are archers both on the elephant's back and on the ground, along with victims from both sides, some of which appear to be underneath the elephant. The elephant appears to be the vanguard of an approaching army, as soldiers with spears and banners can be seen advancing from behind. Below the elephant lies a banner, which bears the title. This map was published in 1720 by Christoph Weigel in his Descriptio Orbis Antiqui in Nuremberg. Weigel, J. Descriptio Orbis Antiqui.